My expectation heading into yesterday was for strong downward movement, followed by a possible bounce, which is exactly what happened. All my first-tier targets across stock indices were reached, with the S&P 500 actually breaking below the 1353 target before bouncing. 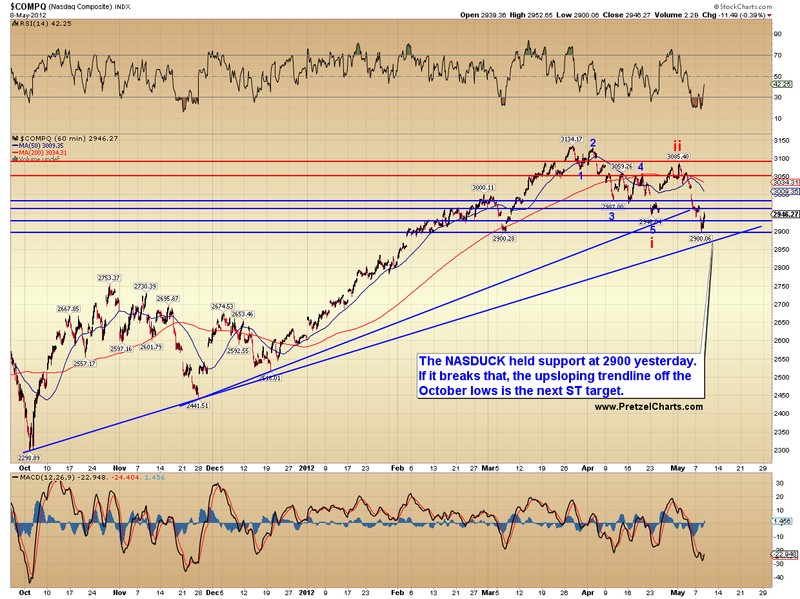 The Nasdaq broke below its target by a miniscule percentage as well. The big picture seems fairly clear to me: the intermediate trend has changed. I can't be 100% certain yet, obviously, but unless the bulls can suddenly pull out a miracle (read: new liquidity flood from somewhere -- i.e., the Fed or the EU), the pattern looks pretty straightforward. This could mark a very major turn for the markets, with the ultimate expectation being that the October lows will be broken at the minimum -- and with the distinct potential for things to get much worse. As it unfolds a bit further, we'll look at longer-term targets. 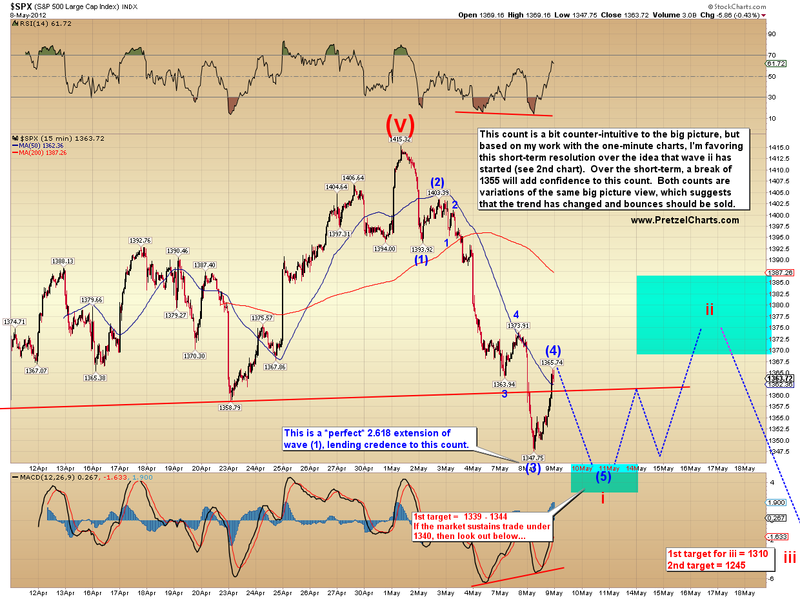 The immediate intermediate (try saying that five times fast) picture is shown below on the SPX chart. The expectation is that this decline is only part of a much larger decline, which is in turn part of an even larger decline. The question I've been trying to answer tonight pertains more to the very short-term picture. 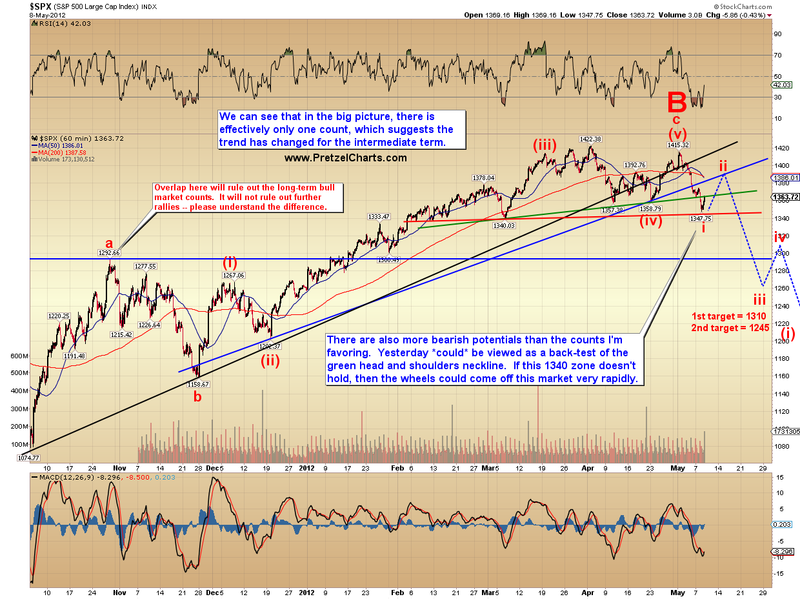 It's possible that red wave i bottomed yesterday, and the market could now be in the process of forming red wave ii. This probably makes the most "sense" from a technical perspective, but when I study the one-minute wave counts, I'm more inclined to believe that there's at least one more slight new low coming before the larger wave ii snap-back rally. I've outlined both short term potentials on the charts below. In the grand scheme, both views are intermediate-term bearish -- so this is simply an attempt to pick apart and analyze the smallest wave structures. The first chart shows the view I'm favoring by a margin of 70% to 30% vs. the second chart. There's certainly enough squiggles on the chart to count the decline as complete, and it always gets dangerous trying to chase that last "maybe" wave. In any case, I view the count below as the less likely short-term resolution. There are also exceedingly bearish ways to count the short-term picture, which would have the market only winding up for an even faster drop, but there's no way to know ahead of time if those are going to play out, and they're always the underdog -- so I'll save those options for discussion only if the 1340 zone is materially broken. That's really the key level to watch at the moment, in my opinion. The Volatility Index (VIX) chart reveals the potential danger of a more immediately bearish resolution. The VIX is commonly called the "Fear Index" by the mainstream media pundits, who have nothing better to do than sit around thinking up clever names for things. Anyway, the bottom line is that what's good for VIX is bad for stocks, and vice-versa. 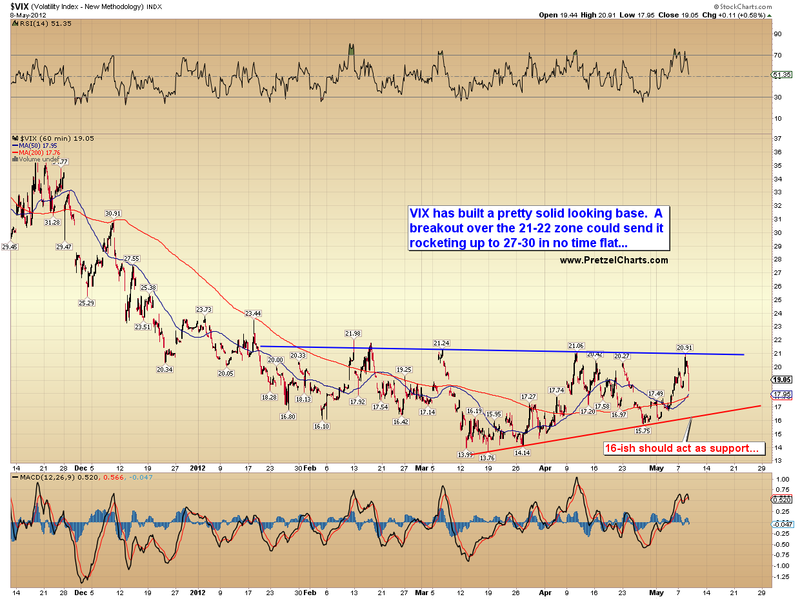 The chart shows that the 21-22 resistance zone is important for VIX, and a breakout there could send it rocketing -- which by correlation implies that stocks would be plummeting. If my short-term counts are correct, that zone may hold one last time before it breaks. I want to share a couple quick charts which indirectly support my view that the markets could find temporary support after the next new low (assuming my short-term interpretation is correct, and they haven't already bottomed wave i). First up is the Nasdaq Composite. Next up is Chevron (CVX), which I believe has a little farther to fall before it puts together a more significant relief rally. I'm looking for it to hit 100 +/- on this wave. 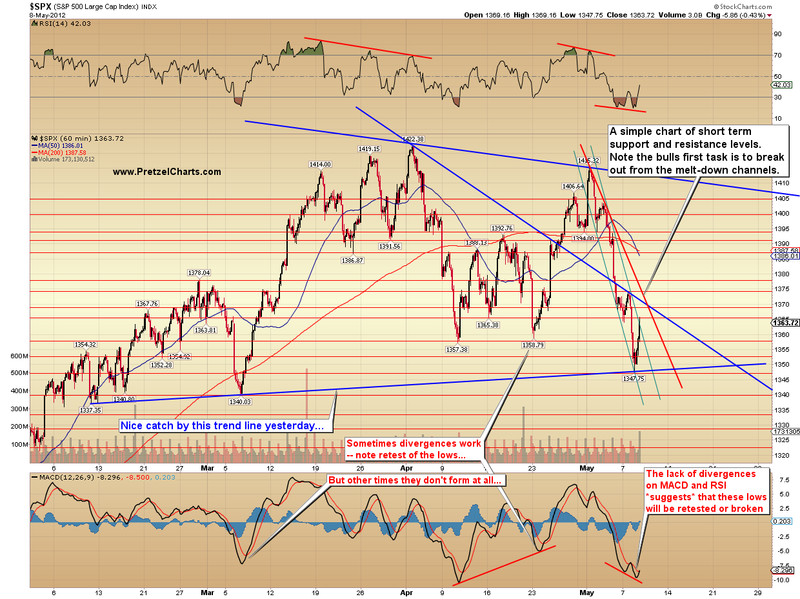 And finally, a look at some simple short-term support and resistance levels for SPX. These charts are often handy for quick reference during short-term trades. In conclusion, I believe the trend has changed at intermediate degree, and that the bull market is most likely over. The market is in a very dangerous position now, and barring a substantial change in the environment going forward, I believe bounces should be sold. Over the very short-term, I do expect at least some slightly lower lows before a larger bounce develops... though I'm less certain of this view than I am of the intermediate view. Trade safe. Reprinted by permission, C 2012 Minyanville Media, Inc. Indeed. My preferred count of yesterday as wave (4) is looking pretty solid right now. Good Morning, In looking at your last chart, I am not seeing the differnece between the example of divergence working and not working. Can you recommend a source to further understand MACD? Great work the last few days! This is gunna be interesting to watch. Global Sacks just upgraded AIG to a buy, will it put in the EW4 'C' on the upgrade and then take a dive down to the 5 locking in the muppets? This will be a good test if EW TA works. Thanks. Basically, there was no divergence on the first one. Just a V-bottom that took off from there. No retest of the "confirmed" low, in other words. My favorite part of the night/day. EVERYTHING'S DONE! Thank you PL. It looks like you were writing a marathon. Quote from Bloomy "it is not the level we dropped to but the speed of the drop. . . "
Trade safe -> Trade safely. I like the NASDUCK that you slipped into the chart. I noticed that yesterday's article showed up on Minyanville, and that there is a new Minyanville copyright at the end of the last two articles. Have you come to a formalized arrangement with them? Thank you for another transcendent article....You're making me break out my Thesaurus, cuz I'm getting tired of writing "excellent". You are your very own ascending extended 5th. Thank you for raising the bar every day. The worst part is that he prolly sleeps like a baby at night. Agree 100% - thanks PL! It's his gilded crib, complete with "blankies". is this a possibility? 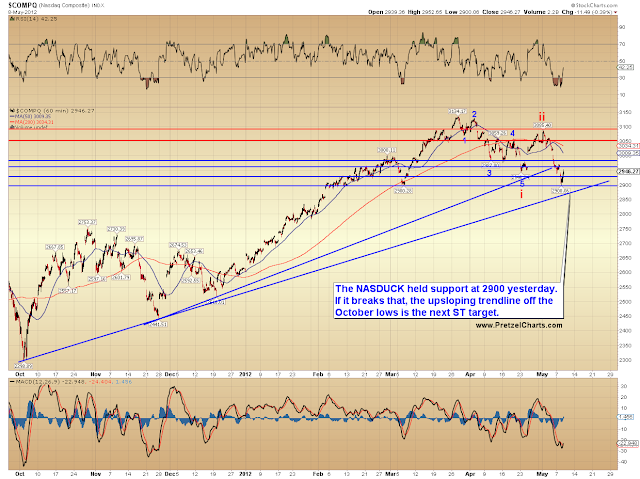 i suppose 1340 is still support benchmark for next leg down... momentum inertia makes the world turn. Some bulls are playing the triple bottom on the ES, is that what you are seeing? Katzo, yesterday you mentioned 'Wanda' and I believe before others have mentioned someone showing up (assume it's 'Wanda') as a contrarian indicator. Is that who you were referring to and what is this person's screen name? I'd like to know to be on the lookout for his/her next appearance. Thanks! Something to do with Wrong Way Wanda Contrary Indicator ? Yes, that is it. The 'WWWCI' - who is this person - what is their screen name? Is it really that pronounced that things shift as soon as she posts - she's always on the wrong side? I didn't notice someone showing up, I did not have time to go back and read past posts. Screen name, that is the problem. He/she/it has about 14 of them now but one can recognize the slang gutter vocabulary. JB can recognize the posts too. Best indicator I have ever found. I just wanted to extend an very special, exclusive 1-day only invitation to our Grand Opening of Katzo's Candles. Don't miss out on this limited time opportunity to exchange those old, worn-out, out-of-style, and barely functioning green candles for our exciting new line of "RED KATZO's". Just remember, it doesn't matter how long the wick is...as long as it's red. Look forward to seeing ya soon. With VIX expiration being next Wednesday, this is too scary for me. I cannot do what an advanced emotionless robot can do! lol... I done and out for the rest of today (too scary for my poor heart). I still am holding the May Strike 30s that I sold last week. I still expect them to expire worthless by next Wednesday. my ST indicators keep on switching from up to down rapidly, either forming a base or setting up to break that 1342.50 ES level, I think the latter. You'll know it when you see it...mostly anger and insults linked with predictions...gotta keep it on the DL...don't want to mess with success. Yeah, as I said at the time, the odds for VIX during a third wave are way too risky for me to be selling uncovered calls. Even if the odds are only 1 in 10, are you going to make money on that play if you take it 10 times and it hits once? Or will you lose money? That's how I look at this stuff -- anything else is gambling. It's weird...every time I ask nice, they seem to cooperate for a good part of the day. Positive energy in the universe kinda thing I guess. you guys are really funny today, ". . . those old, worn-out . . .green candles." and I didn't even have to hit refresh like a zillion times...keepin' it honest.
. . . yeah, sure, testosterone-based TA [T-B TA], I am so sure of this prediction and nothing can go wrong with my call that I will announce my brilliance to the world, usually a very faulty endeavor. . .
DOW down 180, do we have a 180 to 220 rule facilitating the break of my 42 ES level???? I know it's tough to throw yourself up on the stage and think out loud to the world. It takes some serious intestinal fortitude to do that every day. Tip of the hat to you....and remember that you *do* know what you're doing. It's cool. SPX below your 1344 target, I'm out. Thanks for the guideposts! Things to do this morning...#42 Resize the charts. so does that mean we go up from here to your retrace level 1360? That *could* have been all she wrote for this wave down. Is the reason you use white on black so you can work in the dark, or does it not even matter until you post it? very fast mrkt, missed that, was busy, twin pipes on the 15, we go up for awhile, back to 60 area? Prelim. retrace target is 1370-1385. This looks like a typical bear market V-bottom. They're usually fast and furious, to trap the slow shorts. Lots of bullish divergences at that 1343 low. Could be starting wave ii up. Will the short squeezes get more radical as these swings get longer and faster before the main event (VIX above 25-30) ? The short squeezes will become insane toward the middle/latter phases of a bear market. It isn't uncommon to see 30-40-50 point intraday swings in SPX during a good bear market. Are you referring to your Daisy Dukes or something else? Quite a reversal in NUGT today. I got in at 9.06, dropped to 9.02, now it is at 10.11, sold at 9.95 happy day. no retest of the low before a real launch higher, just to screw with the bulls too? Is anyone else seeing that Disqus isn't working at Minyanville? Or is it just my computer? I'm wondering if they got rid of it (possibly related to some of the discussion on my article yesterday)...? This morning *was* the retest. I plead innocent...it wasn't working yesterday either. 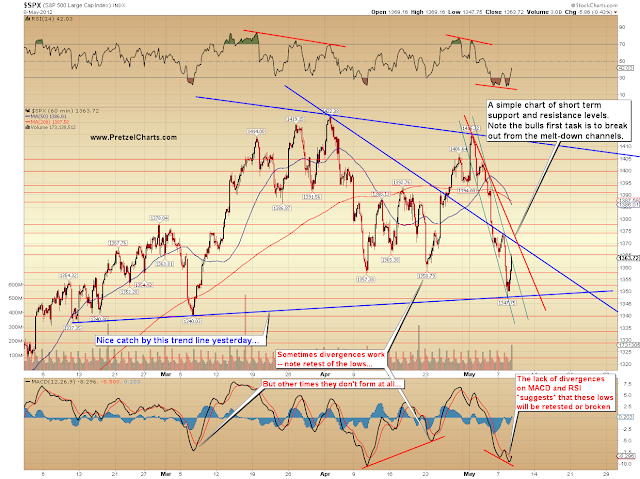 Bulls don't want to see this fall back below 1351 over the very short-term. (screams) "My eyes! My eyes!" I'm out of short positions and standing aside. This picture still cracks me up. The startled look on the Nostra face is so at odds with the campy redneck body. It's almost like he's saying, "What am I doing on this campy redneck body?!?" Once again...I present a tribut to "Blue"
Took a small ES short at 1353.50, just in case. It's a perfect 3-wave rally at the moment. Prolly close it for a quick gain. I dunno, I've never had a prob with Disqus working, so it might have something to do with localized edge servers working out. SPX 1351 still the level for bulls to hold. 1348 is absolutely crucial very short-term. I'm still more bull then bear on the american indices. Could be the a of the 4, but looks good like it is. If it is getting lower I would prefer a double 1,2 instead of the 1,2,3,4 count. A "don't sell in Mai" scenario. Maybe not the most likely, but do not forget it. FYI - the earlier V bounce seems to be tied to rumors about whether Greece will get their promised payout tomorrow - based on the fact that they can't seem to form a coalition government at the moment. Plus, the ECB says the "package" is non-negotiable. CNBC says there will be a formal announcement at the top of the hour. May impact markets. Or a quick small loss, lol. Out. tv said speech in 30 minutes on europe saying could rally market.. caution..
Looks like a clean 5-wave move up now, these levels are no longer relevant. A gift, especially with gold down. Check out the series of 6 up bars on the weeklies for the last 3 years on NUGT. Could this be the start of something bigger than a one day wonder? Watching, waiting - for gold to bottom. Do the miners preceed? FWIW - Astro $.02 - We are in a ST/MT reversal zone between now and 5/15 due to Venus retrograding 5/15 - I'll post backtest correlation charts later today. 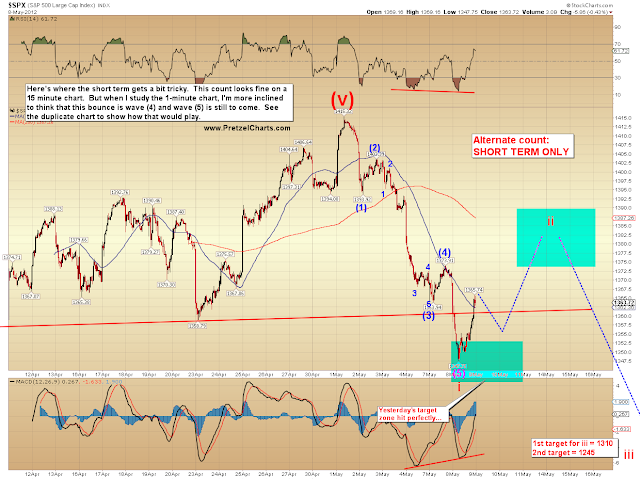 I am using $RUT/DAY as a LT guide, I said 770 would turn this EW ABC into an EW 3 down, here is a pic of the big H&S. As you can see it is all in that area. We just had a hell-of-a bounce off it this morning. Thanks for that info. You'll get a piece of my (assumed) profit on this trade. Warning: I'm playing small on the long side. Pretzel, excellent work! Also, do you have any short-term viable counts that put a high in right about here (SPX approx 1360) before going lower? So often lately the market makes a turn around when Europe closes (within an hour or so), and I'm just trying to see how that would or could play out. Yeah, this is the count that makes me a bit nervous, but I currently don't think it's going to happen. Lots of indicators turned down with this wave. Isn't it funny how they knew to start the rumor right in my target box? I see a clean 5 up, so should be a rally tied to whatever the news noise is. It will be received bullishly, most likely. I see that too. Maybe my count is wrong but w3 looks shorter (by what I was looking at on my chart) than w1 meaning w5 has to be the extended. Points to 1363++ at a minimum, right? Perhaps I'm reading it wrong. Feel free to poke holes in my thoughts on this! I see the GDX pop as a false start, will prolly be one more trip down before the real thing. JMO, but what do I know. 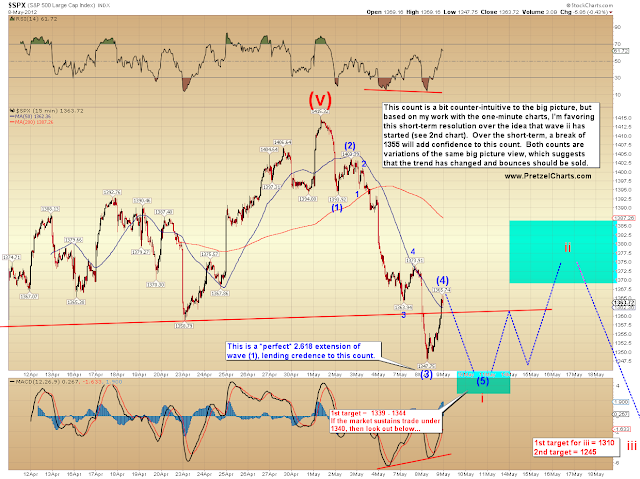 . .
what is after 5 wave up, some down action to come? More than the "average bear". Thanks for this! Nice timing. I got in at 9.58, still holding. I love trading the NUGT/DUST dynamic duo. I count five waves down in eur/usd too. Fell a hair shy of my targets, but I closed shorts there. Thanks. I think we put in the high for this wave, but I think this decline is only a correction before we go higher. that is a pretty big candle, this could override my TA. I see a possible .618 retrace toward the right shoulder ending just below your DT line - around 809.5. Figure (fib) 5 or 6 trading days. ?? Too much retrace? NUGT patterns GLD fairly closely. I haven't noticed it leading or trailing. Both are have been stuck in a downward channel since early March. I have been playing that channel pretty successfully since then. Weird, did my last post not come through? I was saying that it was still a bit vague, and on the 1-minute, you can still view this as an a-b-c up. I'd like to see one more new high to confirm an impulse up. yeah, just trying to identify a ST topping point.... of course, 5 up generally implied another 5'er later... although is crazy, whippy markets....there can be 5's all over the place ... as subwaves of B waves etc. AAPL is taking off today, my TA said the recent sell off was an EW4 and it had one more run up. AAPL can go counter to the mrkt direction too. I have wave 3 as the longest in the chart ( 1 -- means 1 of 3, 2-- 2 of 3 ) etc. thanks Pl.. just to be clear, new high from what number? today or big picture? Some of you may or may not have seen the article I published exactly two weeks ago entitled "Why Does It Agonize Me To Get Bullish." For one reason or another, that particular piece quickly soared to the third "most read" in the brief history of my little blog over there. In fact, a couple of trolls read that title and perhaps the first paragraph and then proceeded to announce to the world that "Short the hell out of the markets... AR has gone long at the top. ", lol. I understood your chart, I was trying my hand at labeling myself on my own chart. I see where I was off after I looked at yours further in depth. However I am intrigued as where I was thinking a 5 would point to is exactly where PL has his target on his newest chart just posted in the thread up above. Please. Trimmed. Groomed. Styled. Zhuuuuushed. Anything but chopped. No I do not love trolls, lol. break 42.5, i'd love to see that. 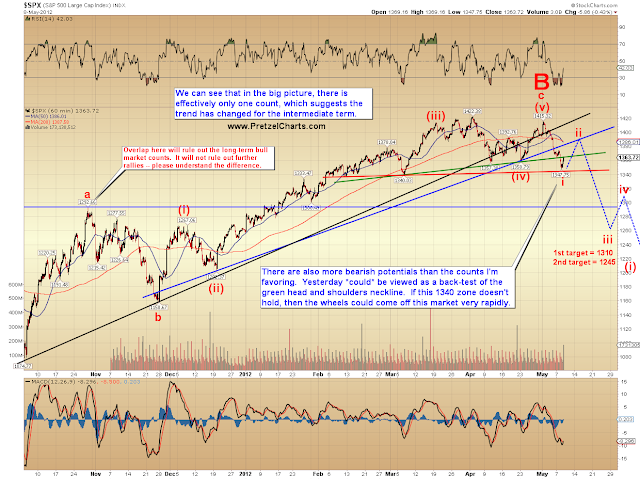 But would that be contrary to PL's new posted chart about another up to 1360?? I use EWT for the majority of my trades, but not exclusively. Sometimes I use more basic TA. I like a combined approach, as I think EWT doesn't work as well used in a vacuum. Here's the link to the "bible" of Elliott Wave. Quite possible. Not encouraged by the ST action. 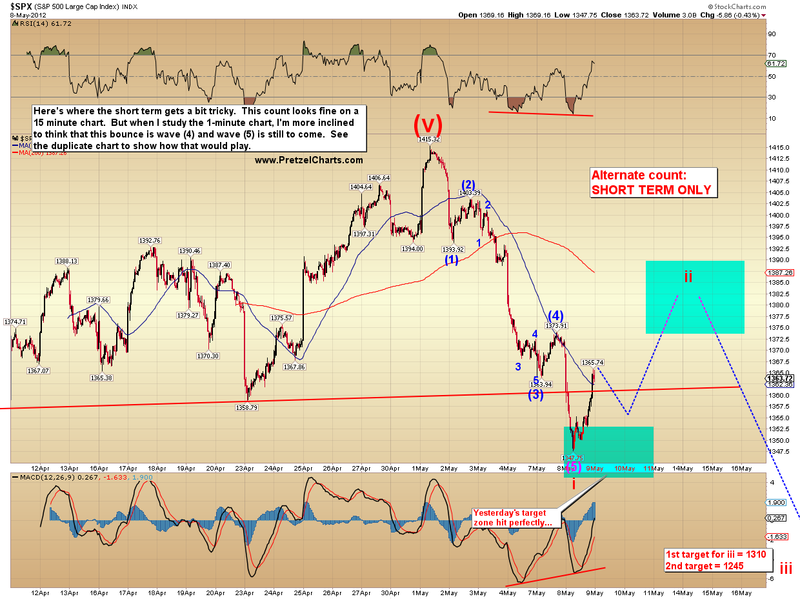 See the chart I posted -- not sold on the rally as an impulse. 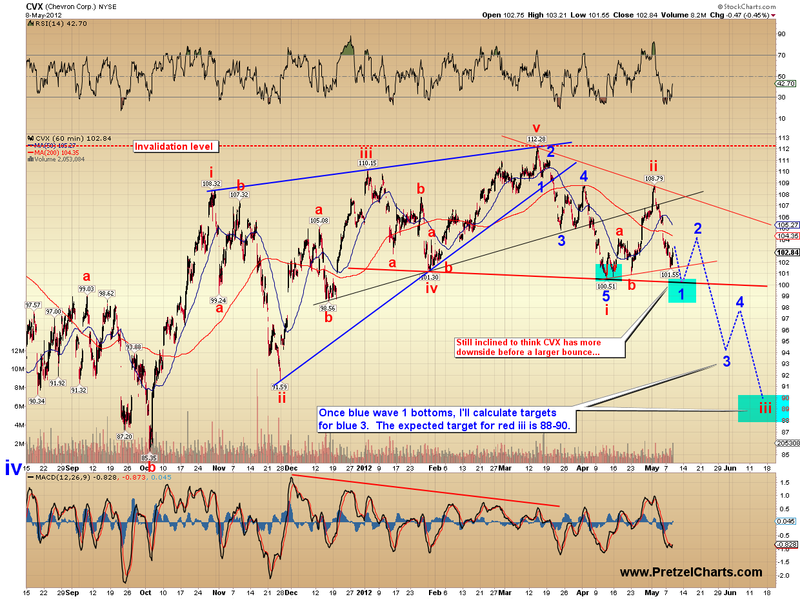 Could be yet another 4th wave. I counted a number of possible 1-2 nests -- hard to resolve to satisfaction, but the potential definiely exists for another wave 5 down. Fully agree PL, this is where TA gets good, was just gunna post same, two independent analysis a the same time. . . They only truly target lower if the neckline breaks... until then, the neckline isn't a neckline -- it's simply support. I've been wanting to buy CSCO for a while now. Didn't have my IRA open in the late fall when I would have loved to grab it at those prices. Maybe if we get a nice downdraft assuming we get the ii bounce it will look even better. I saw a list one time of the companies CSCO purchased back in the late 90's and early 2000's when they were buying companies literally several times a month. It is amazing to see the acquisitions. I can't imagine the team of people they needed to pull that off and see each one through. What happened to the news announcement that was supposed to hit around noon about Greece? Off topic: Did anyone hear about the WV Democratic primary for President? You gotta read this! When a prisoner gives you a run for your money that might be signalling something! May you dream of impulse waves, neckline breaks and bullish jiu-jitsu kicksaves. Same song, second verse, a little bit louder, a whole lot worse. Jeez, the Katzo Corporation has two Maseratis, one Ferarri, one Porsche, three houses, and needs to reassess its outstanding loans. Who can I contact for a billion or two? Looks very much like this played out with a slightly extended (4). I closed my short and went long for +8 pts ES. Flat for now until I see a good entry point for a longer term trade. Thanks for all your great work, PL! I knew those ECB bunkos would cave in again.